Sweatshirts, Cardigans, and Polo Shirts badged with our school logo can be ordered online from a company called Tots to Teams. Use this hyperlink to visit their website. You can also purchase P.E. bags, homework folders and royal blue, badged fleeces and waterproof jackets, which are very popular for winter wear. 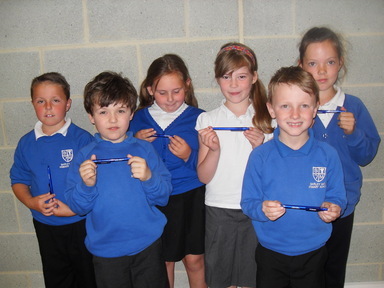 All uniform items are sold at a minimal profit to raise funds for our School Fund. Parents need to provide adequate P.E. kit. Safe footwear is essential. Some classes, but not all, keep a supply of spare clothing for those who occasionally forget P.E. kit. However, parents will be contacted if children persistently fail to bring adequate P.E. kit. PLEASE MAKE SURE ALL ITEMS OF CLOTHING ARE CLEARLY NAMED. On the grounds of Health & Safety, we do not allow the wearing of any jewellery in School, particularly rings, bracelets, and chains. Parents must sign a form accepting liability for loss, damage or injury caused by wearing earrings.Body and nose piercings are not to be worn. Earings must be removed for all PE and swimming activities or masking tape worn over the top for reasons of health and safety. Children are not allowed to bring mobile phones into school. For health reasons staff are unable to insert or remove earrings.